How An Architect Owner Can Make a Big Difference! 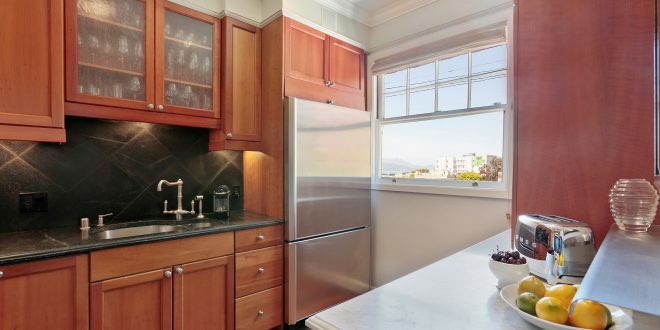 I am excited to bring on a new listing of a three bedroom Edwardian condo which I like to describe by saying “where old world charm meets modern design.” It is located at 1487 Greenwich, #32, in Russian Hill, where Russian Hill, Cow Hollow and the Marina converge. Facing Greenwich, the condo has “peek-a-boo” views of the Bay from the kitchen, dining and living rooms. It has a spacious Master Suite and two more bedrooms plus two baths. It is in a boutique six-unit building. What stands out to me is that the unit has been extremely well maintained and renovated with care. There have been many small, careful details added by the current owner who has a background as an architect so I guess it is not surprising to see her focus on detail. Some of the many improvements include a central stereo system, addition of a marble countertop in the kitchen for making pastry and cherry cabinets with rollout shelves. She has very carefully chosen tasteful fixtures and marble tile for the bathrooms; in one bathroom she added a full length mirror cabinet – I’ve never seen that before! I don’t often see this meticulous attention to detail. The building is also very well maintained and the owners seem to really like each other. I’ve had other listings where that was absolutely not the case. This condo is truly exquisite and worth seeing. It will be open Saturday, June 9 and Sunday, June 10 from 2-4. If you’d like a private showing, just give me a call at (415) 297-7031. Go to http://1487Greenwich.com for more photos and information. Previous: Two Ratified Contracts in One Day – Sweet! Next: Celebrating Buying That First Home!